1. Julio Jones @ DAL- The top-two is interchangeable as far as we're concerned. Keep Julio locked and loaded. He just equaled a franchise record for receptions in a game (13) and has a great matchup against the Cowboys' secondary. 2. Antonio Brown @ STL- See above. 3. Odell Beckham Jr. vs WAS- That 7-146-1 stat line was much more like it. Expect more. 4. A.J. Green @ BAL- The emergence of Tyler Eifert should help loosen things up for A.J. on the outside. 5. Calvin Johnson vs DEN- Megatron had a mega day, particularly in PPR formats with a 10-83-1 line. He gets a primetime matchup with the Broncos next. 6. 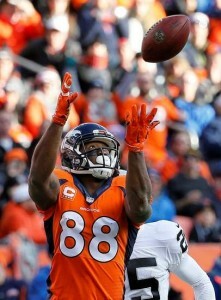 Demaryius Thomas @ DET- Demaryius plodded along Thursday night until he was able to pad his stats in the fourth quarter. His YAC ability can not be underestimated, as the Broncos look to simplify their offense. 7. Randall Cobb vs KC- Aaron Rodgers' top target is a shoe-in for the top-ten. 8. DeAndre Hopkins vs TB- Nuk continues to make plays. He faces a tricky matchup with Alterraun Verner, but he's a target monster in Houston's offense. 9. Keenan Allen @ MIN- Allen came crashing back down to earth after a scintillating week 1. We like his chances to bounce back up towards a high-end quality performance against the Vikings. 10. Jarvis Landry vs BUF- If you're in a PPR format that rewards points for return yardage, you could argue a case for "Juice" being a top-5 play. Landry has been money, and will continue to operate as a major part of the Dolphins' passing game. Demaryius Thomas will continue to see plenty of targets and YAC opportunities in Denver. -Travis Benjamin had a huge day in week 2, hooking up with Johnny Manziel for two long touchdowns. If Johnny Football remains the quarterback in Cleveland, these two have shown flashes of exciting chemistry, and could produce more big plays down the road. -Brandon Coleman could be the answer to the Saints' red zone issues. -Nate Washington is a sneaky play in deeper leagues. He has 9 catches for 168 yards after two games. Good luck to all in week 3.